Amazingly, Beneath have gained a massive following since their debut full-length, Enslaved by Fear, which was released in 2012. The Icelandic band itself formed in 2007 and found themselves signed with Unique Leader Records after just one demo and EP. 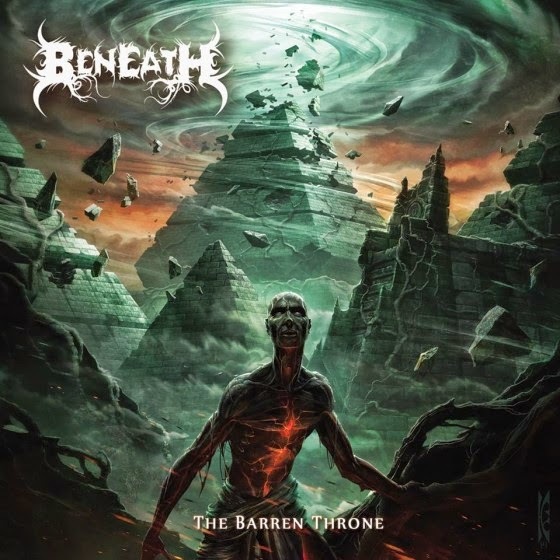 The critically acclaimed work that went into their neophyte LP left the band with thousands of fans waiting for more brutality, and this time around Beneath have ushered in a new vocalist for their succeeding release, The Barren Throne. With so many brutal death metal albums this year showing a focused mindset of 'play it fast and don't stop', the entire genre has succumb to an unfortunate redundancy that's currently plaguing nearly every corner of the underground. Some labels who used to have a "Seal of Quality" approach to their releases are suddenly endorsing less than spectacular abominations; which is confusing to critics and audiences alike. Lucky for you and me, The Barren Throne is far from the shores of washed up generic waste. While the material has a large serving of brash aggressiveness, the compositions incorporate enough variety to break up any potential forthcoming stagnant oasis'. Melodious structures make their appearance abundantly throughout the album, most notably within "Sovereign Carnal Passion", "Sky Burial" and "Storm Drainer", all of which have a plethora of interesting twists and turns throughout their longevity. The album even begins with a tame acoustic picking, which is an element that can be found in small abundance throughout the majority of songs. The mass of The Barren Throne is an unrelenting assault of triggered bass drums, fast tremolos, throbbing bass lines and hefty power chords under a powerful, repugnant set of vocals. Though don't let its gruff exterior fool you into thinking the material is a one-trick pony, many of the smaller sections of the content are filled with acoustic picking, grooving hooks, melodious leads and tons of drumming variety. Even though the album boasts a good amount of triggered bass drums, the areas that this element makes its appearance emphasize a calculated driven chaos. With the aid of diversity, the drums mix things up with tribal tom-tom patterns during "Chalice" and the title track, "Unearthed" starts with an enthralling drum solo that starts off with quick wrist flicks on the snare and escalates into a fast series of rolls. The tremolos from the rhythm guitar are interlaced throughout the material where appropriate, such as in "Iron Jaws", which is one of the more intriguingly crafted tracks of the album. The lead guitar takes on a lighter distortion versus the rhythm, which causes the fantastic solos to come out tight and clean; everything from scales to tapping and lightning quick hammer-ons/pull-offs are present, and they are unleashed during precise moments to ensure the content never becomes audibly cluttered; which is the bane of much of the recent brutal death metal releases. "Sovereign Carnal Passion" is equipped with one of the more harmonized introductions that includes some brief rests, allowing the lead guitar to build a series of small bridges. The deep, harsh bass also stands out in abundance here, giving the listener their first clear glimpse into this element. "Storm Drainer" is another track that will throw the listener continual composure curveballs with melodic breaks, ritual drumming and mid-tempo leads. The overall immense brutality of the content lets up during "Sky Burial", which is the most canorous song of the album. The bass shines through the rough set of groove laden hooks and gives an atmospheric depth to the song; along with the slightly distorted clean picked interludes and slow, harmonic leads. The Barren Throne is definitely one of the better brutal death metal albums to come out this year, but it's far from being anything as remarkable as say Devourment or Deeds of Flesh. It's revitalizing to hear some brutal content that doesn't rely on slams, breakdowns or a continual barbaric assault. The material within this album is made up of a vast array of tempos and compositions, which keeps it changing and flowing throughout its duration. Worth a try for enthusiasts of the genre, but if you're into the new wave of slams and breakdowns it probably isn't for you.